DISCLAIMER: But first, a quote from the Sears owner's manual, "DO NOT make any altercations to this product". I am not a mechanical engineer. I built this dolly based on what "looked right" to me. Who knows if it's safe? If you're dumb enough to replicate my example, you're on your own. UPDATES: I have made significant modifications to the dolly over the years. Be sure to look through the whole page. Some ideas worked. Some didn't. After several iterations, I'm reasonably happy with the end result. 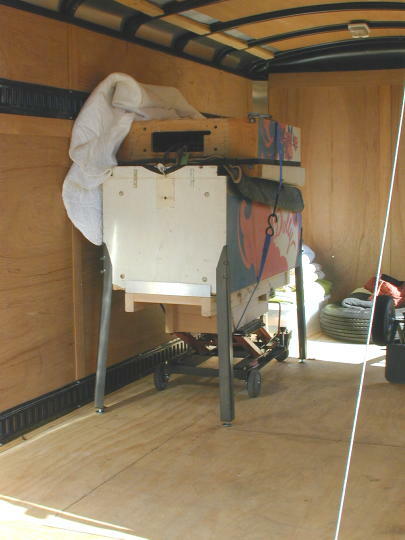 Also check out my Portable Pinball Lift. 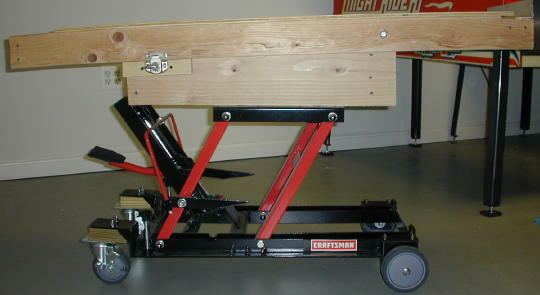 The starting point for this project was a Sears motorcycle/ATV lift. 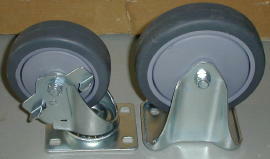 The Sears lift comes with four 3" steel wheels. I replaced the steel wheels with a pair of 4" and a pair of 5" rubber wheels from a Tractor Supply Company store. The wheels feature large hubs, ball-bearings and roll real nice. Each is rated for 350 lbs. This modification is not necessary, but does offer several advantages. 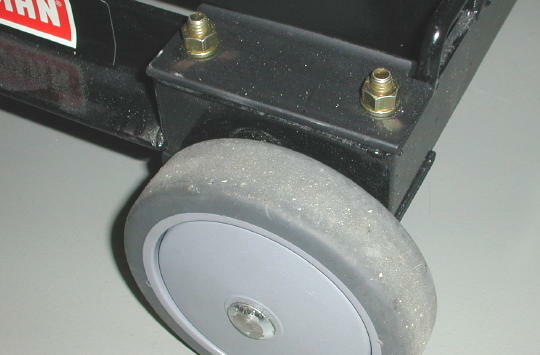 The larger wheels roll easier over any rough or uneven surfaces and the rubber is less destructive to gameroom floors. The four wheels cost about $50. This was the second most expensive purchase next to the lift itself. Everything else that went into this project was just nickel and dime items of lumber and hardware. Rubber wheels from Tractor Supply Co. Shown below are the fixed 5" wheels. I made new axles out of modified carriage bolts. This wheel modification required some careful consideration. Since the wheels are larger than the originals, they need to be mounted outside the lift frame. 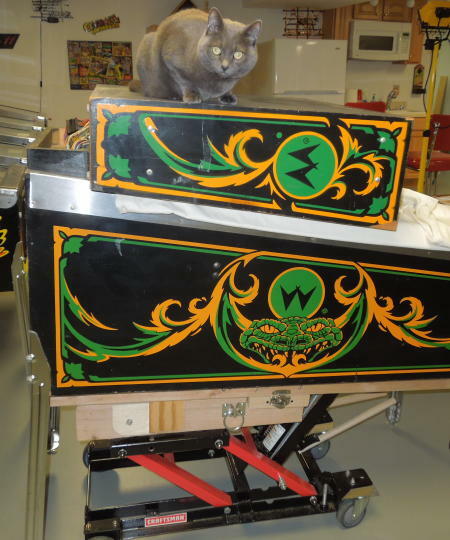 But with the new wheels in place, the lift is so wide that it just barely fits between the front legs of a standard, modern pinball machine. I selected wheels that were thin, but still offered adequate carrying capacity. The 4" swivel wheels (with brakes) are bolted in place with two new mounting holes. Even though these 4" wheels are smaller than the 5" fixed wheels, this end of the lift is a little higher because of the mounting arrangement. Next I made a 12" by 28" extension frame from 2x10 lumber. The picture shows how I ripped a shallow wedge off each side of the frame. 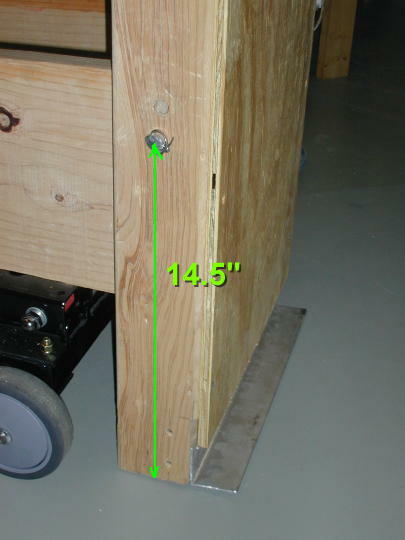 This is because the bottom of a pinball machine cabinet tends not to be exactly parallel to the floor. The angle of the cut is about ½" per foot. The cut is somewhat arbitrary since no two pinball setups are alike. I also rounded the back corners to accommodate the tilt bed described below. The radius of the corners is 1¾". After assembling my extension frame I temporarily removed the lift platform and secured it to my extension frame with eight lag screws. Tearing the rubber pads off the Sears lift platform revealed convenient pre-drilled mounting holes. I mounted my extension frame to the lift platform with eight lag screws. Reassembled lift with extension frame. At this point the dolly is ready to move pinball machines. 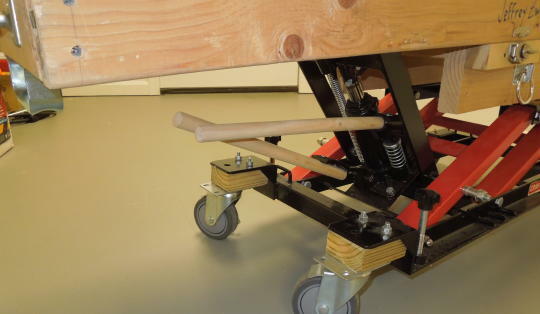 But I also wanted to add a tilt-bed for tilting machines between their up-right and on-end positions. 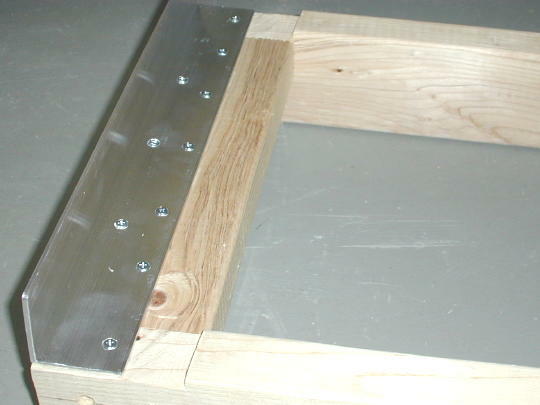 The tilt-bed is a 15" by 54" frame of 2x4s. 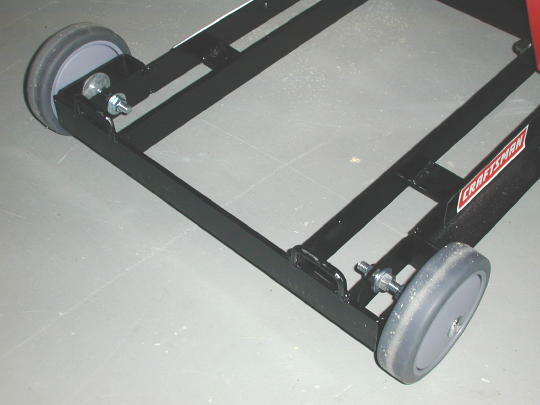 The back of the bed has a 2" aluminum angle piece that acts something like a hand truck when the bed is in the vertical position. Note that the angle piece is recessed into the frame. 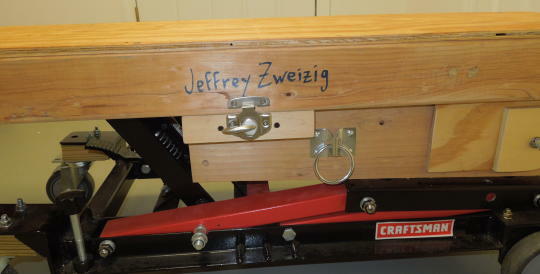 The frame has a ½" plywood top. The plywood does not extend to the ends of the bed. This accounts for the lip around the bottom edge of the pinball machine. I also added a handle to the front of the bed. Tilt-bed with a 2" aluminum angle piece. 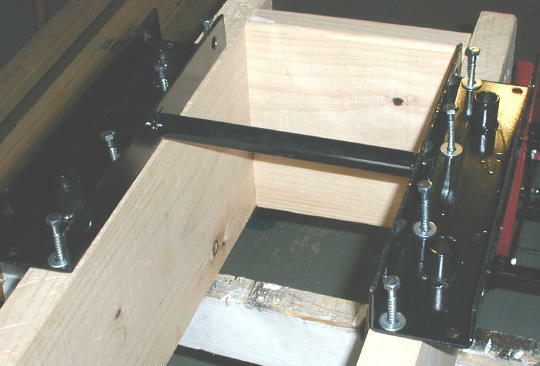 The tilt-bed is pinned to the extension frame with a ½" aluminum rod and cotter pins. The pivot point is 15¾" from the back of the bed. This is another arbitrary measurement I picked because it "looked right". 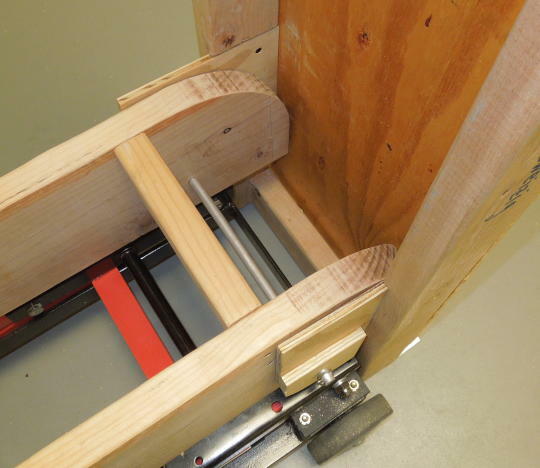 Tilt-bed is pinned to the extension frame. Here's another view of the rod with the bed in the vertical position. 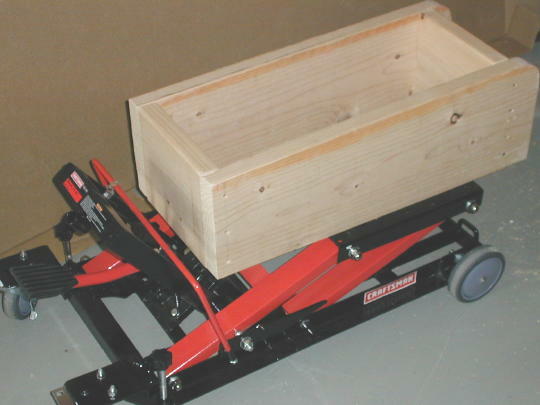 The finished dolly is shown below. As can be seen, the red T-handle that comes with the lift is not of much use. 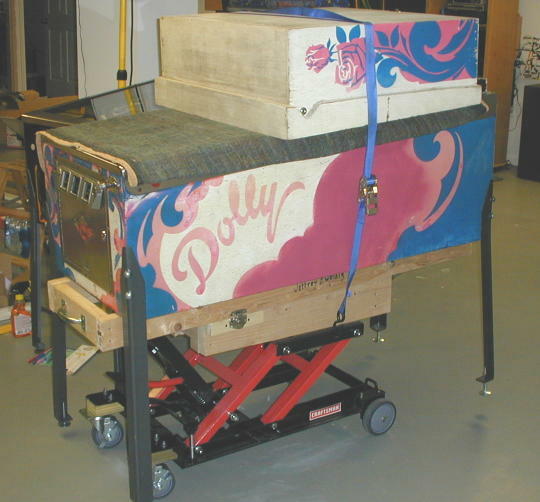 Not only does it interfere with the dolly modifications, it limits how far the dolly can be pushed under a pinball machine. The handle is easily removed with the pull of a pin. 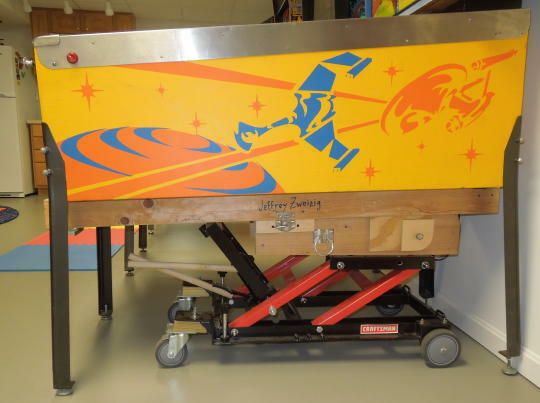 The dolly is very easy to roll around just by gently pushing and pulling on the pinball machine itself. Finished dolly before the T-handle was scrapped. 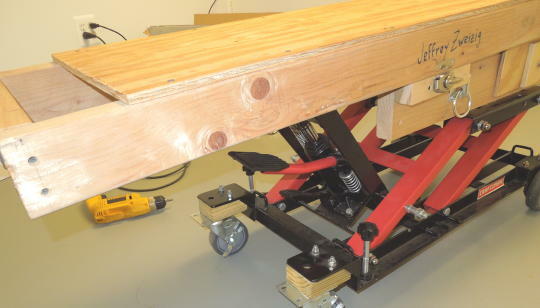 To set up a machine I first raise the tilt-bed to its vertical position and adjust the height of the lift such that the back of the tilt-bed is resting on the floor. 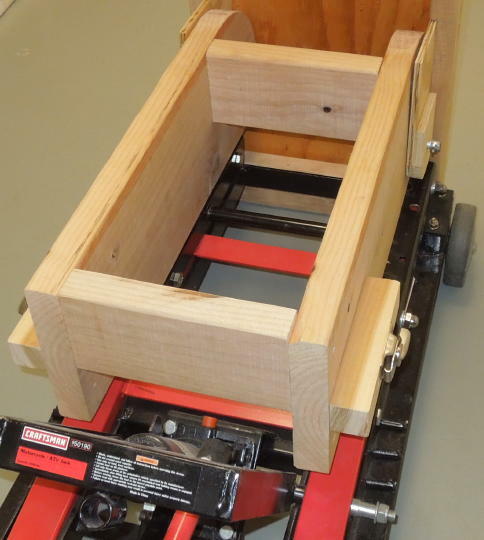 Next I position the bed beside the bottom of the machine just like a hand truck. I secure the front of the machine to the front of the tilt-bed with a ratchet strap (The Sears lift includes a pair of ratchet straps). I put one foot on the front of the dolly, grab the tilt-bed handle, pull toward me and pivot the machine to its horizontal position. 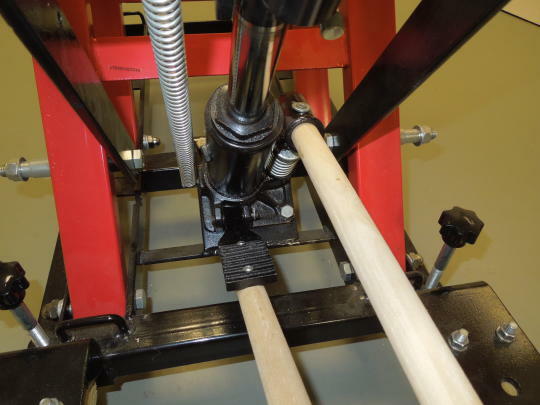 Next the machine is jacked up and the legs are leisurely installed without any backbreaking acrobatics. 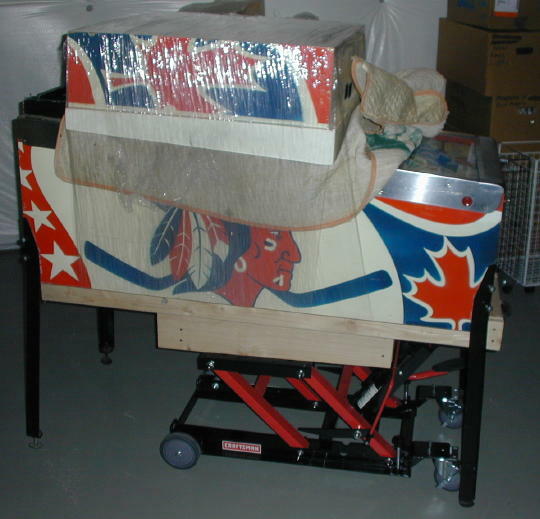 Lastly, the machine is set up and rolled into position. 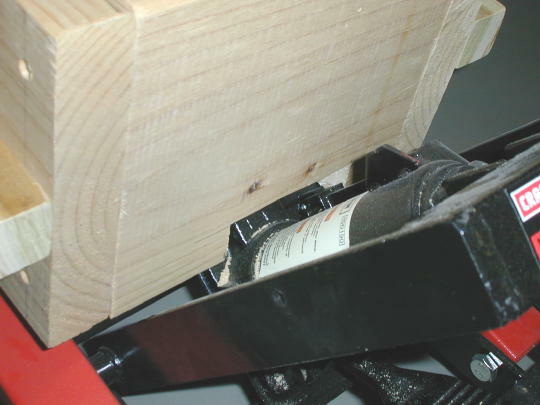 Machine strapped to the tilt-bed. Machine pivoted to its horizontal position. Set up and rolled into position. 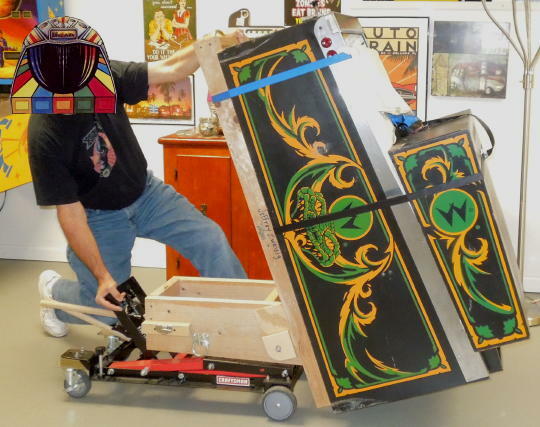 I'm not the first person to turn a motorcycle/ATV lift into a pinball dolly. Check around the Internet for more ideas. 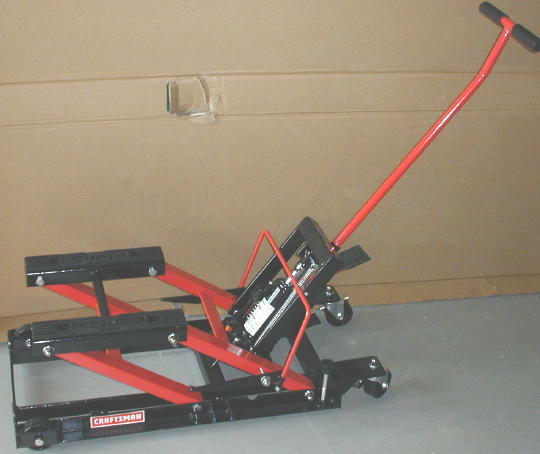 If you're looking for a similar prebuilt solution, do a search for the PB Lifter and PB Tilter. 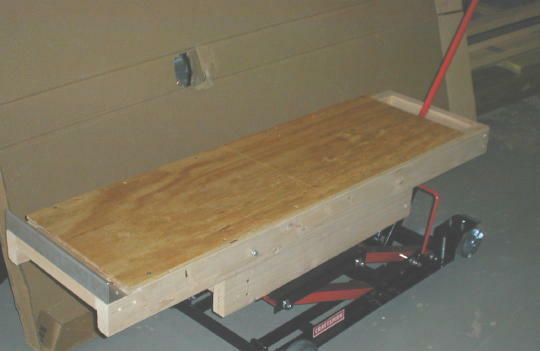 My original intent was to use the dolly only to move pins around the smooth concrete floor of my basement gameroom. Then I began to think that the dolly could be more versatile. 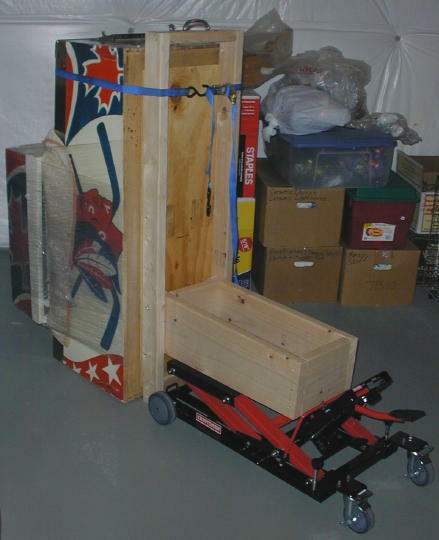 With a few modifications I could use the dolly to move pins in and out of the basement as well as in and out of my Pinball Hauler cargo trailer. Mostly what I needed was more ground clearance to get over door thresholds and other obstacles. The modifications are outlined below. 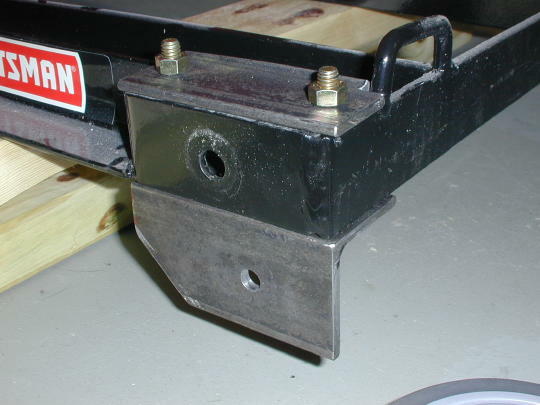 To raise the rear of the dolly I made new wheel brackets from 3⁄16" by 2" angle steel. I used a second piece of 3⁄16" steel and a pair of bolts to clamp each wheel bracket to the lift frame. Raising the front was easy. I just shimmed up the frame with some wood blocks and longer bolts. 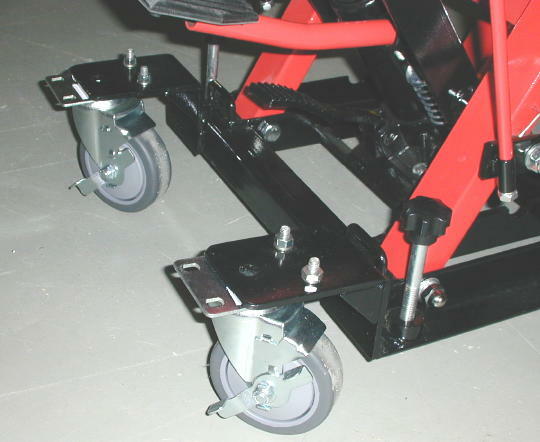 I'll need to lift the front wheels over obstacles (as opposed to lifting the tilt-bed). 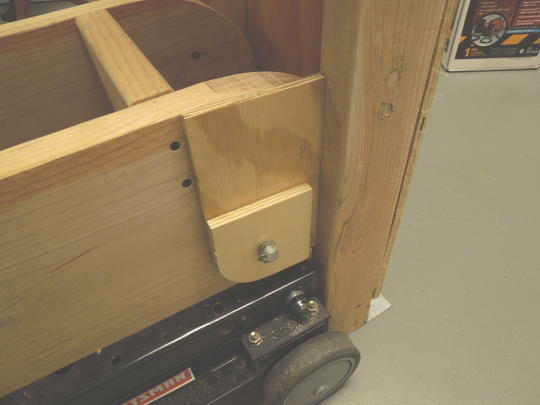 So I added a sash lock to each side of the dolly to lock the tilt-bed down to the extension frame. I drilled some holes in the lift platform to accommodate a tie-down strap. When transporting a game the head goes down, but the game remains horizontal and the legs stay on. The lift originally came with this ratchet thingie that's supposed to prevent the lift from accidentally lowering. I never used it. And it was in the way, so it got scrapped. Next I cut a notch in my extension frame to fit over the hydraulic cylinder. This allows the lift to get down a little closer to the floor. Then I drilled for a new pivot point and repositioned the bed. Now the pivot point is 14½" from the back of the bed. Ratchet thingie removed and scrapped. Extension frame notched to fit over the hydraulic cylinder. Out the door, up the ramp and into the trailer. It doesn't get any easier. The rubber tread on my wheels is a bit too soft for outdoor use. The rubber picks up a lot of pebbles and grit that need to be scraped off before coming back inside. The tread is beginning to look like Swiss cheese. It's probably okay for my limited use. But, if I had to do this again I might look for rubber wheels better suited for outdoor use. First I cut about 2" off the back of the extension frame to bring the tilt-bed closer to the rear wheels. So the outside dimensions of the frame are now more like 12" by 26". If I had to do this again, I'd use straight 2x10 lumber without ripping a wedge off the bottom as noted toward the top of the page. The slope is insignificant. Construction would have been easier if everything had been kept square. Fortunately I didn't use any adhesive when I originally built this thing. It's all easy to take apart and modify. Tilt-bed position before and after cutting the extension frame. Next I drilled a new pivot hole 6" from the back and 6" from the top with a corresponding 6" radius cut around the top rear corner. This places the pivot point slightly in front of the rear wheel axles. New pivot hole in the extension frame. 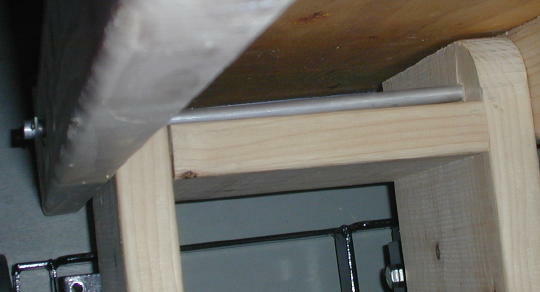 The tilt-bed required extension brackets to reach the new pivot point. I make these from 8" squares of plywood. 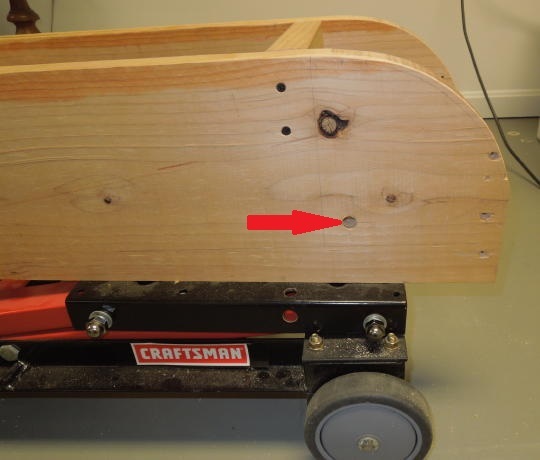 I used thin plywood to minimize the amount of wood I had to hog out from the inside of each of the tilt-bed's side frames. 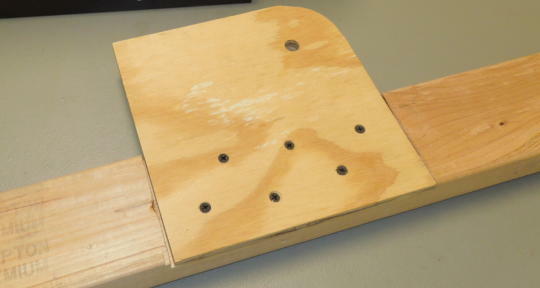 I laminated another 4" square of thicker plywood to each bracket to increase its bearing surface. 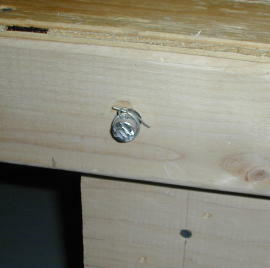 An extension bracket recessed into the inside edge of a side frame. 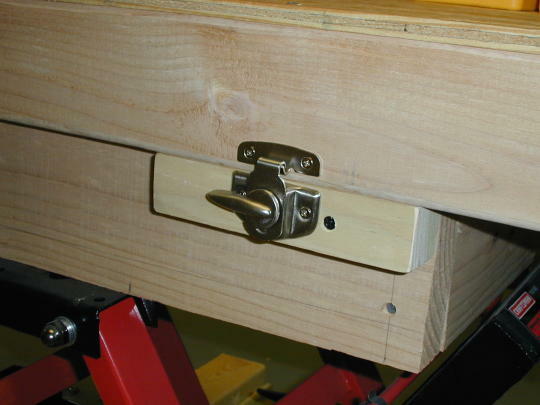 An extra lamination of plywood increases the bracket's bearing surface around the pivot pin. 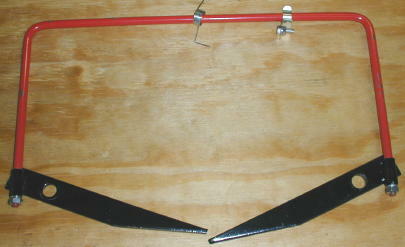 A top view of the new pivot arrangement. I also recut and repositioned the extension frame's cross members. Now they're smaller and don't interfere with anything else like the hydraulic cylinder. 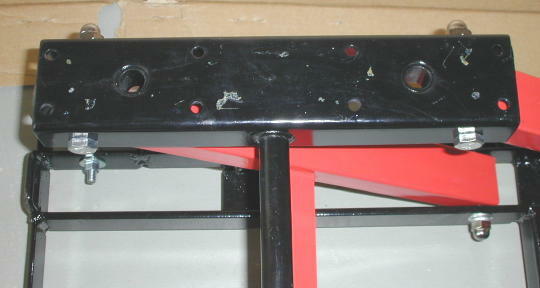 These modifications moved the tilt-bed forward on the extension frame by about 11". I had to reposition the hooks for the sash locks. I also abandoned my old tie-down holes and added a new tie-down ring on each side of the extension frame. 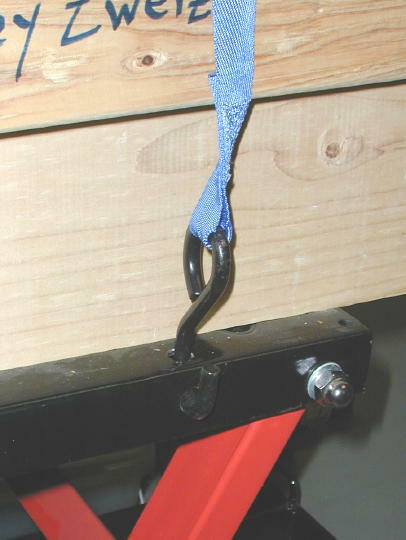 Sash lock and tie-down ring. 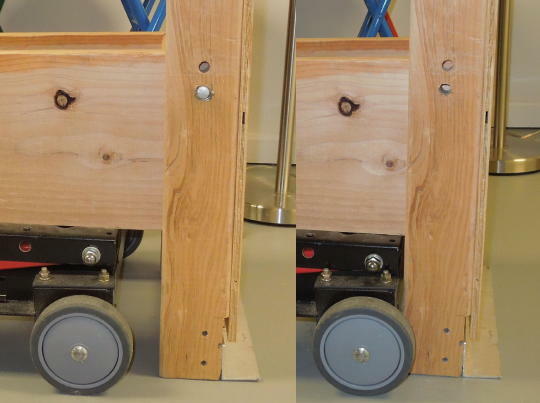 Moving the tilt bed forward better balances the game over the dolly. But it makes the jack pedal controls even more inaccessible. First I'll note that I always operate the jack with my hands, not my feet. 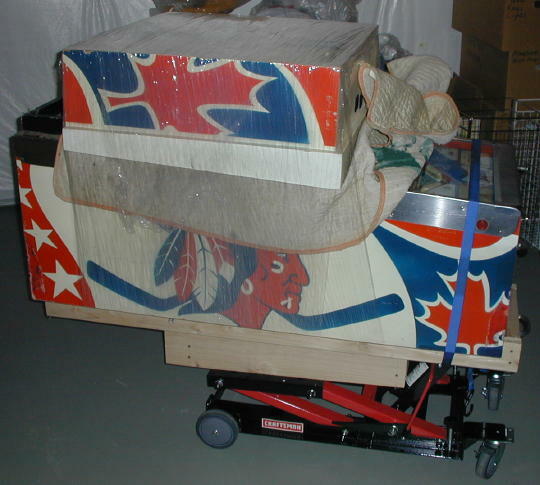 I'm usually on my knees as I'm moving the dolly and/or game into its final position so it makes sense to use my hands. Plus I have more control over the movement of the jack with my hands. So my goal was to make handle extensions, not pedal extensions. The jack pedal was basically just a pipe bolted into a socket. That was easy to replace with a 7⁄8" dowel. As for the release pedal, I removed the pedal, drilled some mounting holes, added another length of dowel and reinstalled the pedal. The dowels shown here are pine which was probably good enough. But I eventually replaced the jack handle with oak. The jack pedal controls are difficult to reach. 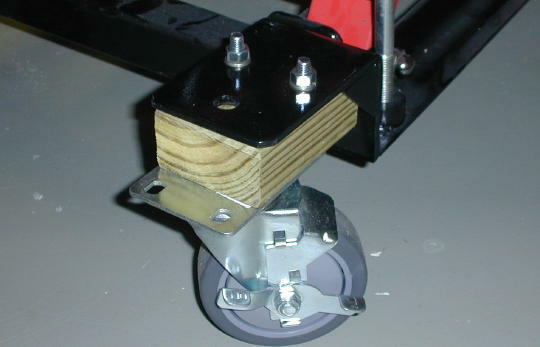 The game is better balanced over the dolly with the tilt-bed moved forward on the extension frame. Balancing a game on the new pivot. All four wheels stay on the floor. Another aspect of the tilt-bed that I never liked is that the game becomes more difficult to control the closer it is to vertical. There just isn't much leverage. My latest version 1.2 modifications actually made things a bit worse in this regard. It's pretty obvious why the PB Tilter product comes with a winch. But after some playing around I figured out a new technique that makes it all work. I put my left foot against the rear wheel with my heel on the floor. For balance, I put my right knee on the front wheel bracket. I grab the top of the tilt bed (not the handle) with my left hand. Again for balance, I grab the jack frame with my right hand. In this way I'm using my left leg muscles to do most of the work and I can gently move the game to and from vertical. 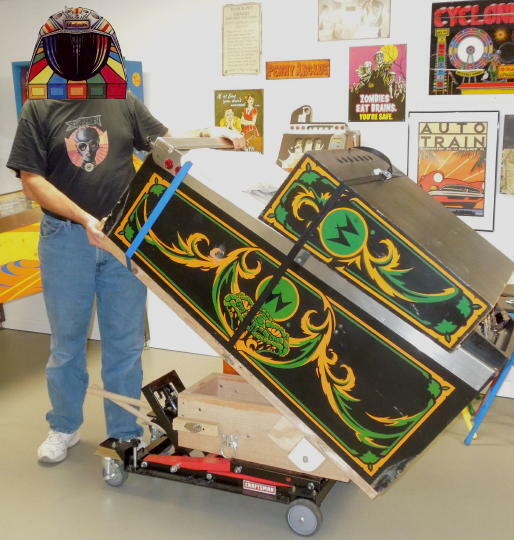 In any event, my Portable Pinball Lift turned out to be a way easier tool for rotating a game. 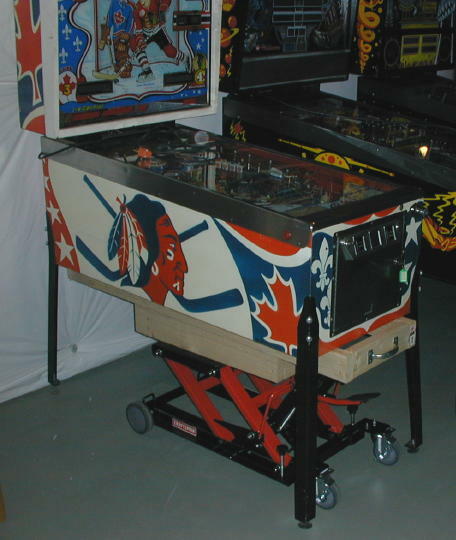 In fact the Portable Pinball Lift is so easy to use that I may never again use the tilt function of my Redneck Pinball Dolly. Smokey rides the Redneck Pinball Dolly.